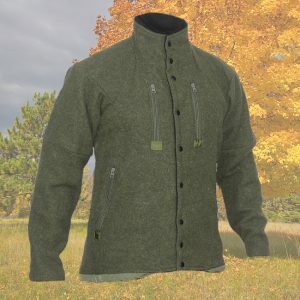 **Visit Lester River Bushcraft and you’ll find the 100% wool Olive Green Boreal Shirt. In the 10 years since we bred the first one, more than 2000 shirts have shipped to folks who really wail on clothing: S.E.R.E. instructors, deputies, SWAT Teams, the US Forest Service, guides, and other rugged souls. 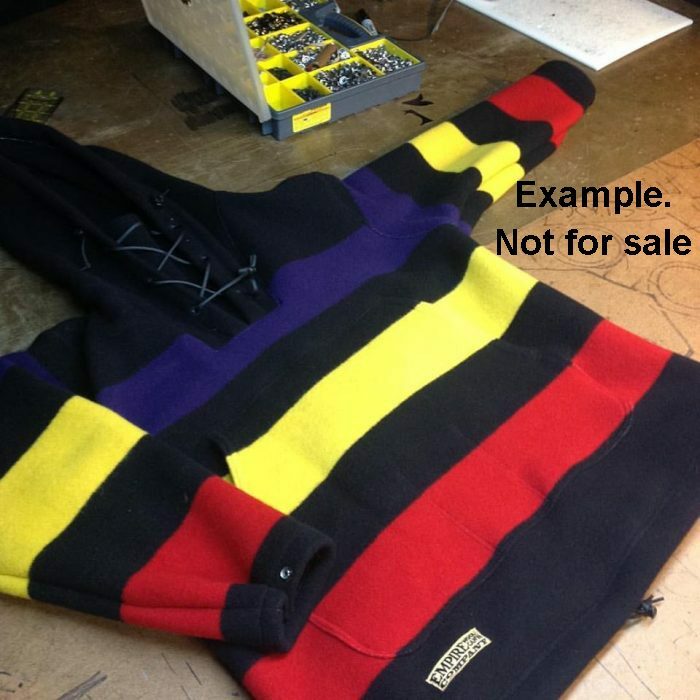 Want to get one from us? 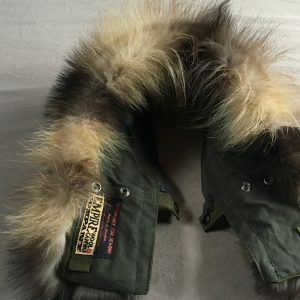 Buy from our occasional stock. 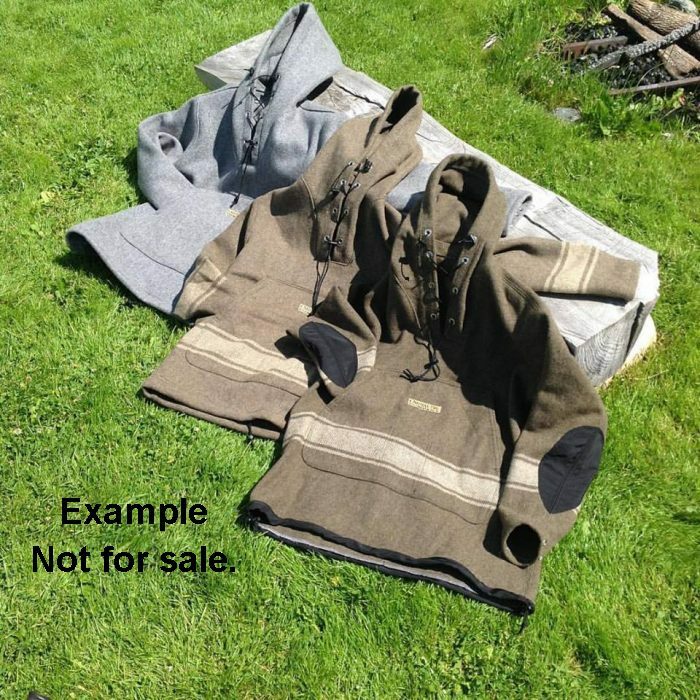 We’ll find a blanket or two locally, or take them in on trade from customers. Got a nice blanket? Got permission from your household? Drop a line to empirecanvas@charter.net, and we can chat about it. 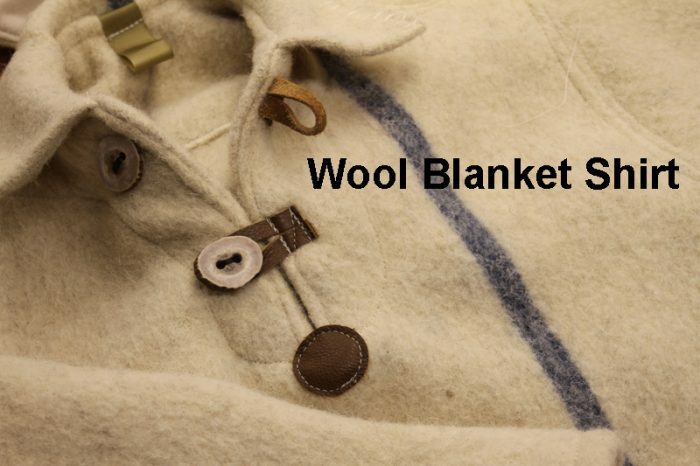 –The Wool Blanket Shirt Is Classy. We start with a thick wool blanket. 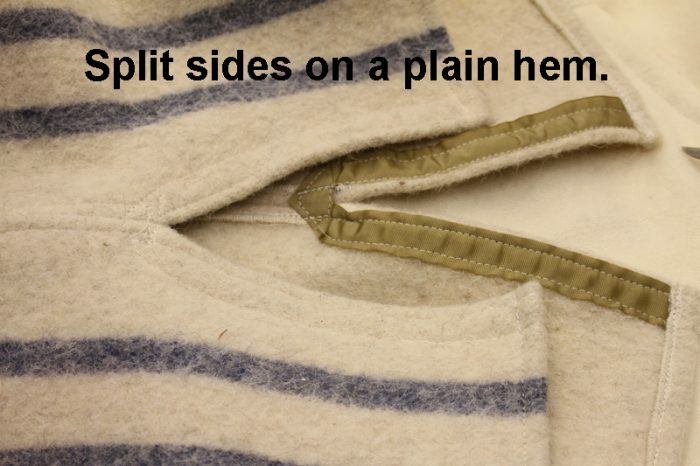 Then we cut and stitch them with B69 Nylon thread and heavily serged seams. 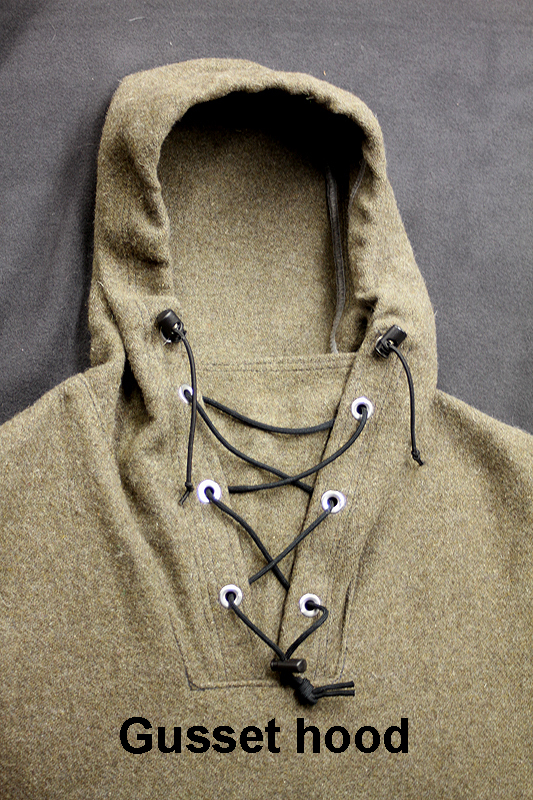 The shallow neck opening has deer antler buttons, made right here in our shop. 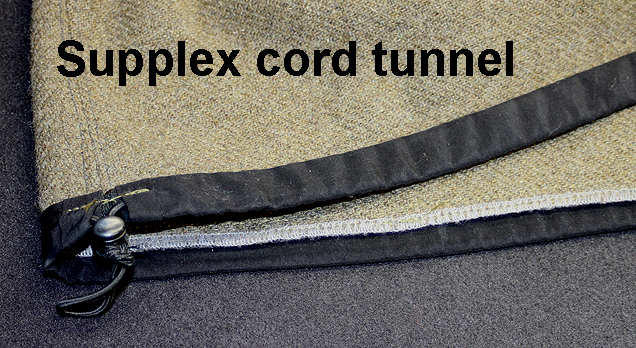 Our simple collar rolls down when you don’t need it, and snuggles high against your neck when you do. 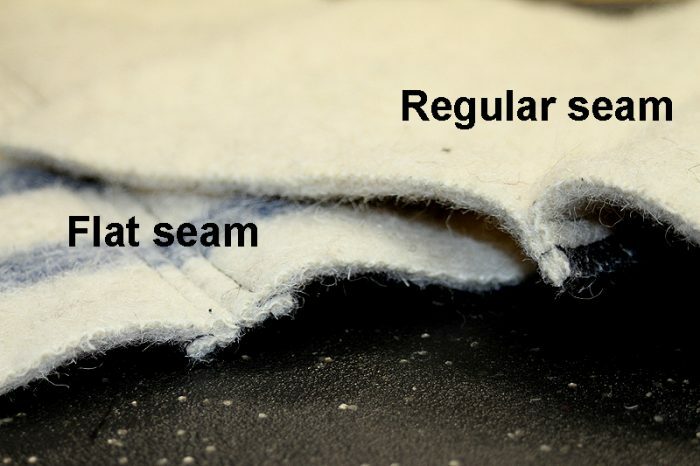 The WBS is romantically large and long, so the plain hem reaches to mid thigh. 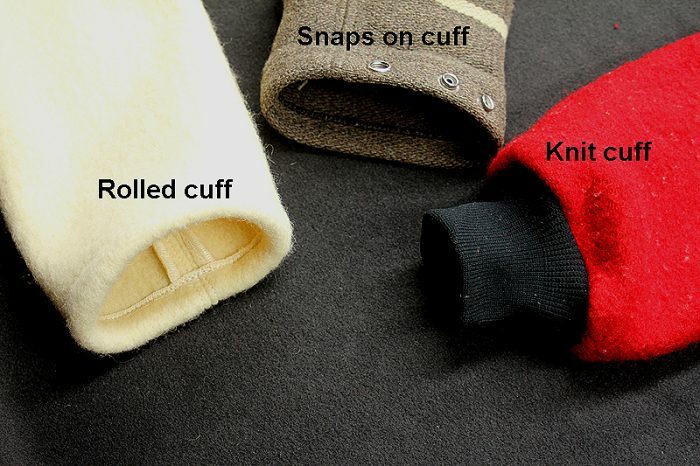 Rolled cuffs ride down over your wrists, leaving room for you to tuck in your work gloves or wool mittens. 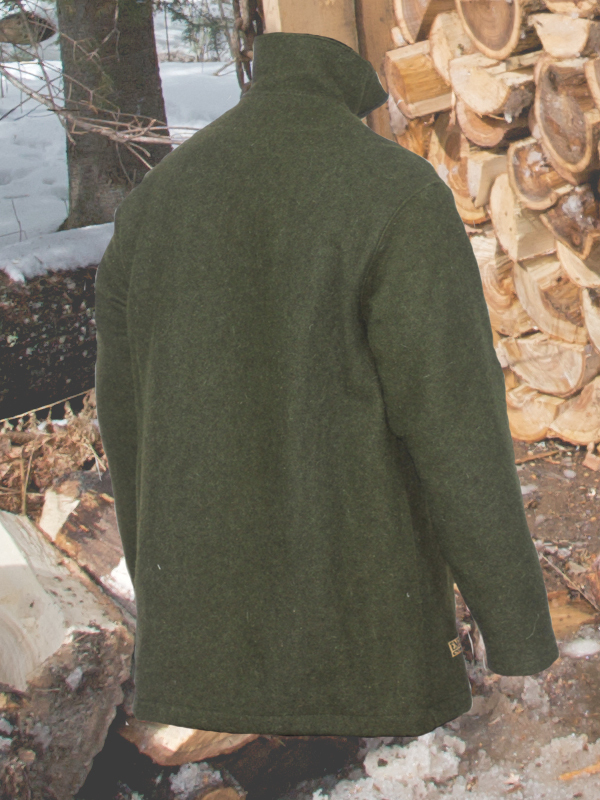 –The Boreal Shirt is a different animal entirely. We began with the universally cool WBS pattern. 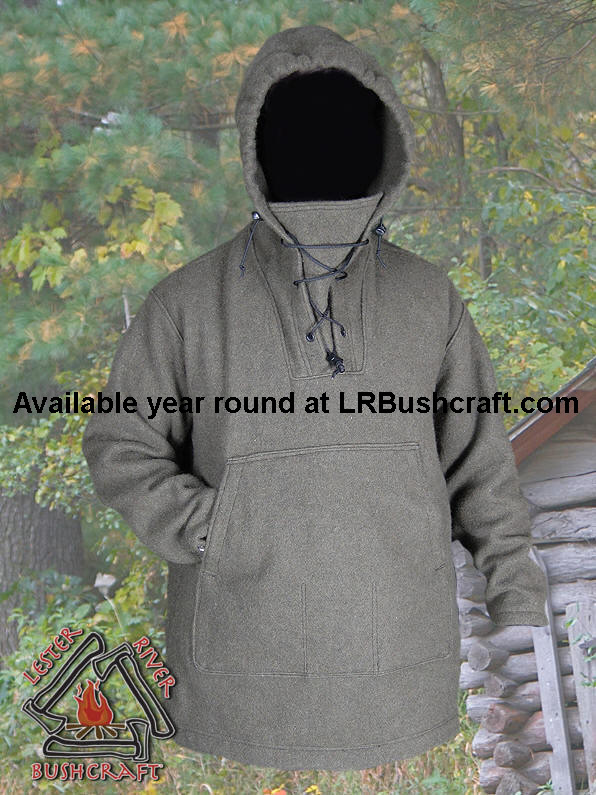 We added full coverage hood that rides just high enough to cover your hat, but it still fits inside a shell. Crank down the visor to cradle your face, or open the gusset and drop the top for warmer days. We kept the depth reasonable so it won’t cut your peripheral vision. 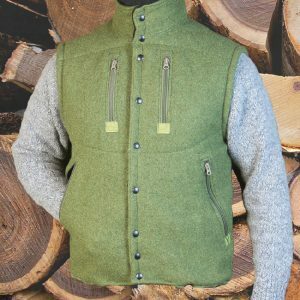 The huge front pocket is perfect for warming your hands. 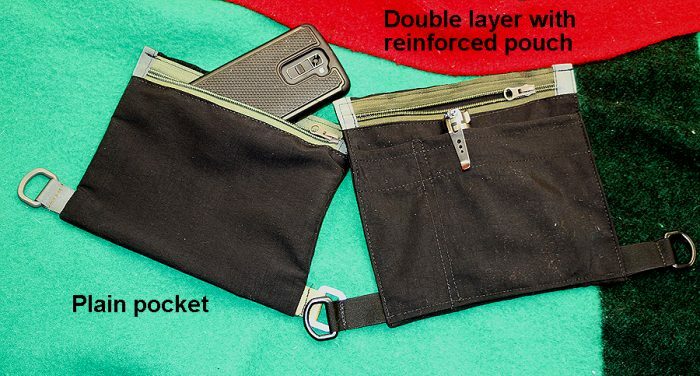 Inside you’ll find three small pouches for foraging or holding tools. 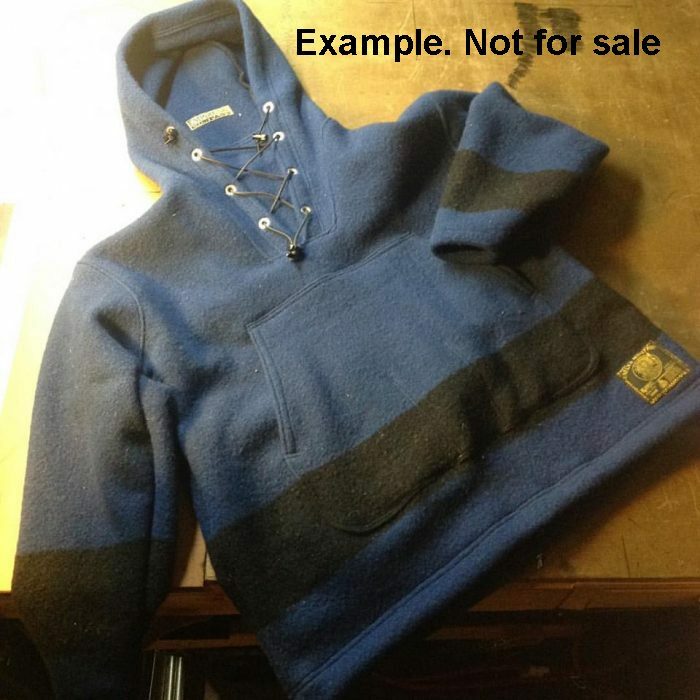 The base model has simple rolled hem and cuffs. You can accessorize to your liking below. 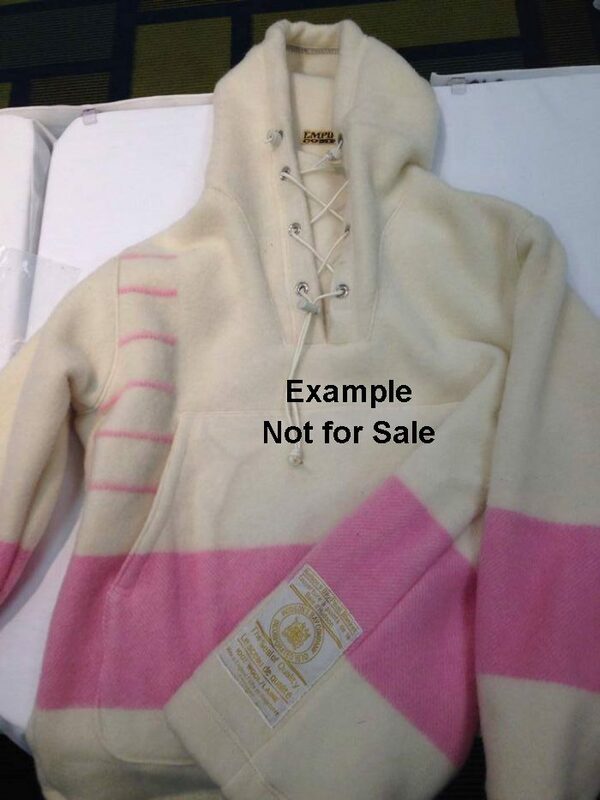 -Don’t need the hood? 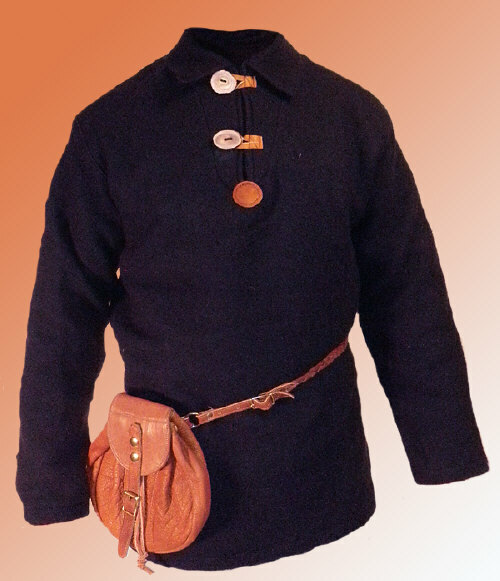 Try the Scout Shirt. 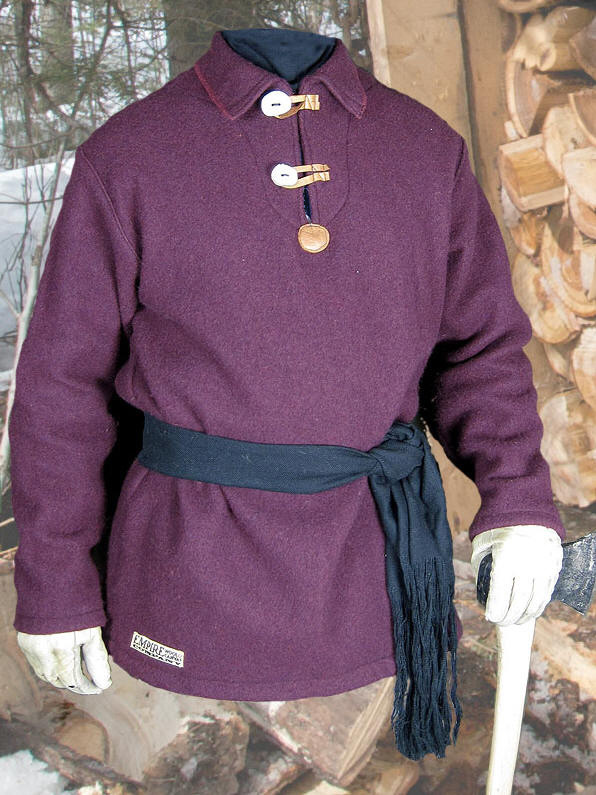 It sports the same fit and features as the Boreal, but there’s a zippered, fleece-lined collar in place of the hood. Now comes the good part. You choose the options for your shirt. 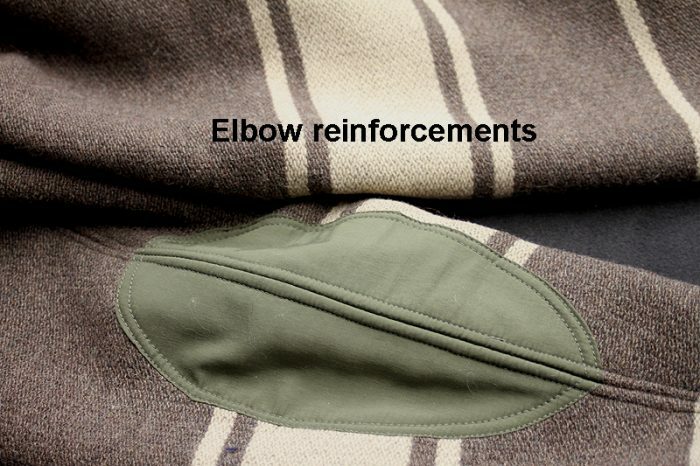 Elbow patches? 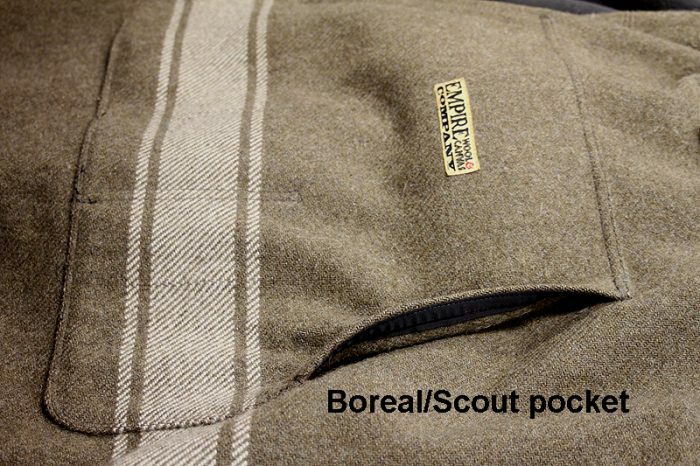 (Boreal and Scout Shirts): Supplex Nylon Elbow Patches +$45 This option is only available with flat seamed garments. Kangaroo pocket? 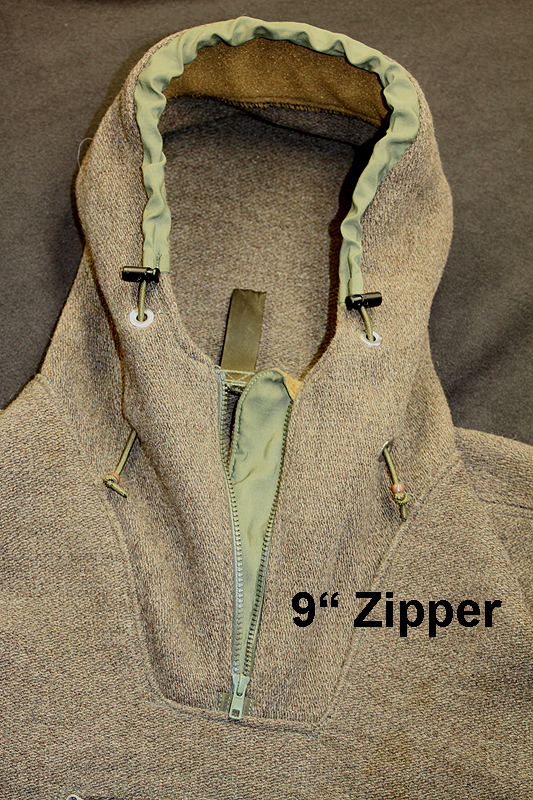 (Boreal and Scout Shirts): Zippered access just below the neck gusset. Approximately 7″ x8″ +$55. 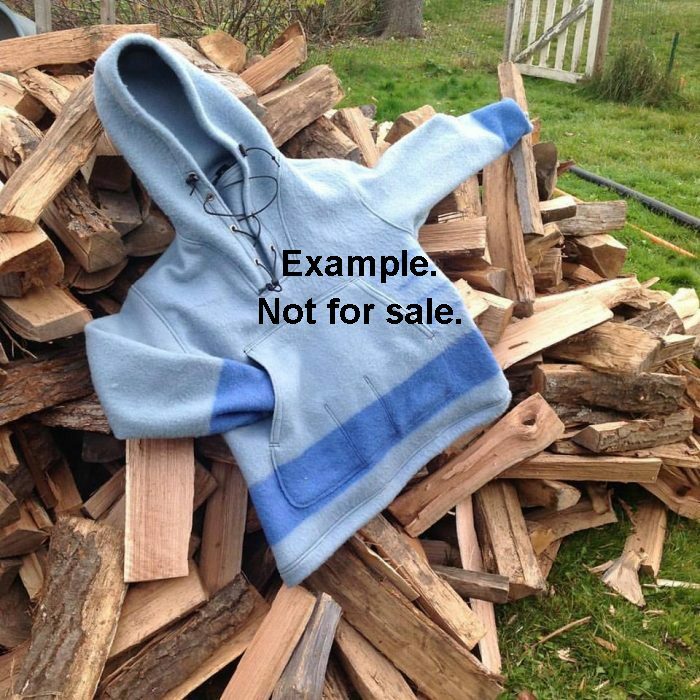 Not available with deep zippered hood. 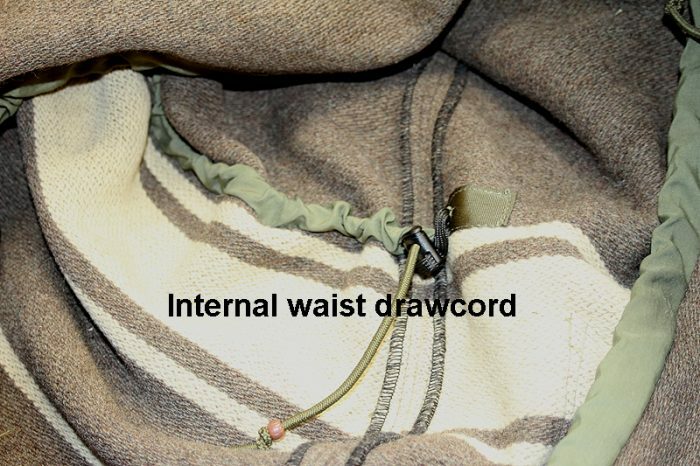 Waist draw cord? 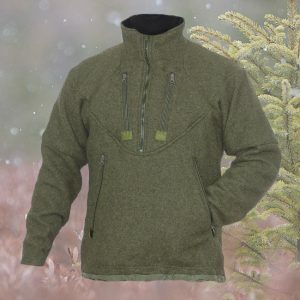 (Boreal and Scout Shirts): Supplex Nylon tunnel lies just above the hips to reduce the profile of the shirt when you need a trim fit, or want to trap body heat. +$40. *If you’re curious about blanket sizes, shirt sizes, and options for building a shirt, please write us at empirecanvas@charter.net.